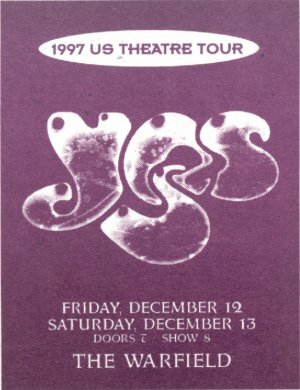 I have been to over 70 YES concerts and this was the best one. Stood 3 feet from the stage in front of Jon in the stage lights. It was like being in a movie. Great show. According to the audience audio recording, on December 12, 1997 in San Francisco, CA, "Children Of Light" was played BEFORE "Khoroshev Solo"! 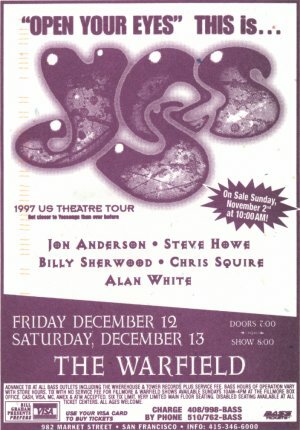 The second of my four shows on this second leg of the 1997 North American tour, and the first of two nights at the Warfield. This is another iconic 2,300-seater venue. It was originally a vaudeville theatre. The spirit certainly imbued Chris Squire tonight, as the bass man strutted his stuff, not least in his (perhaps rather overdone) solo spot. Since we arrived in good time, I managed to have a decent peak at the stage set up while the �Open Your Eyes� ambient track � which gets you in the mood for the concert nicely � was playing, Then loud cheers greeted the quiet opening bars of Stravinsky�s �Firebird�, as a prelude to show opener �Siberian Khatru�. This time I was nearer the front, central and slightly on Howe�s side. There were no set changes from Sacramento. The sound was much better, at least where I was sitting. Squire�s bass pedals shuddered through my frame. Marvellous. Once again, Igor Khoroshev was highly impressive. Technically he is top notch, shows a real understanding of the material, and produces some decent and appropriate sound patches. �This is the keyboard player Yes should have�, was my overall thought. Billy Sherwood�s contributions to the rich sound mix are more textural, both vocally and instrumentally. Jon Anderson�s voice is as fabulous as ever, Alan White nailed it once more, and Steve Howe was on fire. A fine incarnation of the band, on good form. I very nearly didn't make it, as I was still recovering from a bout of bronchitis, and that would have been a shame -- not only would my friend have had to go alone, but I would have missed a singular & powerful phase of this ongoing soap-opera of a band. All you fans who missed the light shows and stage decorations and costumes: I feel for you -- I really do. But what the band seemed clearly determined to do was to rebuild from the music up, and that's what made this special: this wasn't YES, the mega-selling success, but rather Yes as we might have seen them in 1970: a club band, hungry for success, and determined to win it by blowing away any thought of any other band. No tricks, no eye-candy, just hard-practiced musicianship. And they jammed like I've never seen them jam before or since. Behind a black curtain decorated only with the YES logo, the Firebird finale began -- punctuated by no instrument but Alan's bass drum. The curtain suddenly leaped up, and Steve opened Siberian Khatru ... a little slow, actually, as he did on the KEYS. Likewise, by the end of it, they were thundering along at a juggernaut pace and a furious intensity. YES had arrived. This became the rule for the night: Every song possible taken to a jam-intense extreme -- phenomenally so on Steve's solo section during 'America', the high point of the show to these ears. Ironically, this was when my die-hard friend disappeared to get rid of the large beer he'd drunk earlier; he missed it! But he did not miss the fiery three-way solo jams on the outro to Rhythm of Love, a song I had never previously thought much of. Tonight changed that: they showed just how YES that song could be. Heck, why stop there? They did it again on Owner, each soloist injecting more spirit & joy each turn until the song just couldn't bear any more. Not that every song was a burn-a-thon: And You & I was as pretty as you could want and more. In fact, I rate this the single best version I have heard; by the last crescendo, Howe was pouring forth shuddering downslides out of his steel guitar. I've heard him do this other times, but never so effectively. The whole night went like that: nothing new, but everyone was so energetic and interactive. The only slight lull in the show was Revealing Science of God, which has always run a little too long [it would make a killer 10 or 12-minute song]. Evidently they thought so too, for it was dropped by the time I saw the end of the tour. Some have questioned Billy's inclusion, and none have praised it. This puzzle is easily solved: Billy took over Steve's vocal parts, an event significant to those who will admit that this great guitarist has a mediocre singing voice. Painful reality! Plus Billy's inclusion allowed for the remaking of the Rabin-era material, although it is true he didn't do it as well. But that's not to say he didn't do a good job of it. Now, I know many would rather forget the Rabin era, but that does not include the band themselves; they chose it, they meant it, and they had great success as a result -- a stated goal by the band themselves. Old-guard fans may be glad it's over, but the band sees that as being just as much a part of their history, part of YES, as the Wakeman era. So while I share the view that this band needs no second guitarist, I admit this was the strongest the band ever was vocally [as noted above, Igor got in there too!]. Also, I wonder if they weren't sort of holding a place for Trevor, thinking he might change his mind. It was a good show, certainly enhanced over previous ones I've seen (except perhaps 1975 in Spokane) due to the small theater atmosphere. The band seemed to have honest fun together in diverse groupings, which was a nice change. The only signs of less than solid comradery were when Igor stepped on Steve's little rug at the close pre encore (a little rookie treatment, perhaps) and when Igor appeared to be a hair late on an entry (per Steve's view) in RSOG. For the rest of the show, I saw welcome enjoyment of the evening between Chris and Jon, Billy and Chris, Steve and Igor, and Alan and Chris/Jon. Chris' showmanship seemed more appropriately in check, letting his real skill speak for itself. As has been said before, Jon's voice is in great shape. Best ever I've seen. And he issued forth some good self mocking humor, subtle at times. Alan reminded me that he is much, more more than the timekeeper for this band, and his contribution was a highlight throughout. Biggest surprise of the night was Igor on keyboards. The guy obviously LOVES Yes music. It's great to see him get into it with joy and abandon. I found myself watching his fingers and facial expressions with binocs often for his talent and pleasure in his music. His solo was quite beautiful and he appeared free of ego - hear, hear. Molodets, Igor - fsivo xoroshiva. RSOG was the highlight, as the band was incredibly tight and together. It took me way back. Owner of a Lonely Heart was disjointed and odd - maybe others will know what went wrong. Rhythm of Love, however, was good in terms of vocals. Of course, Billy adds VERY little compared to Trevor, but the vocals and Steve make up for that loss. Siberian was a throwaway, but All Good People a surprisingly tight, fun piece for the umpteenth time after all these years. Put Roundabout to bed for a few years. HOTS and Starship were great. The latter really showed the band's guitars strength across the board. Steve is amazing in terms of diverse styles, ranging from near country to Rabin rock to classical and beyond. He may look like the living dead, but his talent is just amazing. The band can ill afford to lose him. It was great to see him more full of life than in past years. I see them again in San Jose tonight. I went to the exhibit of Roger Dean art Thurs pm in the City and got Dean's autograph on my recently rediscovered program from the 7/75 yes show in Spokane! His art was selling for like $150,000 a piece!!! He was very unassuming, nice and not a real public figure type. I saw Jon A at a bookstore appearance in SF Sat. More great self deprecating humor and a taste of his philosophy. Honest about life in Yes. Cut "Soon" from the set list due to an infection he caught in the Mediterranean that limits his range. Said HOTS is a challenge too. He sounds superb fegardless. Said he's a workaholic, as is evident by his going to Maui to relax and doing his latest recording! If Yes is coming your way in the new year at a small theater, don't miss it. The weekend's shows welcomed YES into San Francisco with extraordinary perfect sets: good round sound, full to the breath and to the bass-bone-pulsing-depths. Firebird Suite and Siberian Khatru through to Starship Trooper every night. The best night was Friday, voices on, music perfect, the crowd charming ("'TENN' true summers" license plate fans, especially, up front; also, Roger Dean among the attendees since he's had a showing of work at the S.F. Art Exchange...for Bay Area people, it's a gallery on Geary near the theatres b/w Mason and Taylor: see the AWBH acrylic...6'x6'...before the show closes). SK, America, CttE, and RSoG (near-end set song) were the stand-outs of the set; lovely solos by everyone; Open Your Eyes and Child of Light became new standards; hardly a flaw in the night. Saturday was a special event for Jon fans since he appeared at Borders Books for a promotional for his solo release, EarthMotherEarth. His voice strained (by his standards), and since he was trying to keep it strong for the Saturday YES show, he didn't perform. He answered questions from the audience concerning his work and his approach to music/life/spirituality. A blessing of an encounter, he asked that there not be any autographs, although photos were taken, both during his talk as well as walking the streets of San Francisco. Saturday's show was a good night with some obvious and fun flaws: Jon stuttering out the words and flubbing them to &Y&I, so several up front, singing along, brought the spirit back to the song; some notes by Steve seemed to be hints of Sound Chaser echoed later in Chris' Fish. No real surprises ni the set list, even though it's the last legs of the American '97 tour. Well, what an awsome chance to see Yes twice in a row! I have seen them probably 15 times since 1975 and I was blown away. I did however notice a big difference between the two nights. Friday Steve was much more introverted. Chris was a "Ham" as everyone has said, but I did not care for his overly bombastic sound and performance. Saturday Chris was much more subtle and etherial. I almost had the impression that he was somewhat boozed up on Friday. Overall : Saturday was a much more energetic and perfect show. They just seemed more into it that night. Igor was great! I did not miss Wakeman at all. This young guy can really play and has all of the energy that Rick has seemed to have lost recently. Billy was just sort of there, a non entity. Jon was incredible, great voice as always. Steve was truly magical, especially Saturday night. Chris is, well Chris! The greatest rock bassist in the world! Revealing Science was the highlight of both nights. Long live Yes!!! Its the morning after-am going again tonight. A few thoughts: It is really nice to see the band again -they played with high technical merit, maybe some lack of enthusiasm being used to larger audiences and greater fame. It sort of reminds me of seeing other performers who moved to smaller venues-just not as exciting for them. Got to love the music, however, good lightshow too. Now....... the Warfield- it is just a dank dark dirty theatre-did I forget smoky? Id rather see Yes in a setting that is representative of beauty rather than cigarettes and beer. Any other thoughts on this? Either Zellerback or Berkeley Community Theatre, how about Davis Symphony Hall for that matter. Their music is just too beautiful for the Warfield. I dont like niteclubs,lol. The ultimate torture for Peter Banks would be to be locked in a room with 'The Clap' playing 24 hours a day. Someone said that Jon's appearance this time round reminded him of Richard Simmons. Well (must be the hair) Squire reminded me of Al Bundy! Speaking of which I really enjoyed his solo this time around - not something that I really got into previous times. I liked Igor's playing a lot and I liked his solo piece - it gave all kinds of hints of what he might be able to do. I wonder what it would be like if he were turned loose inside Yes as an integral part of the songs on the next CD. I'd be much more interested to hear _that_ than to hear it with Wakeman, which would be nice but not we know there would be nothing earthshattering. Next time around - I predict they'll try Sound Chaser (the tease in Squire's solo tempted me.) Igor should have no problem with it. They absolutely murdered OOaLH. Otherwise I liked just about every other song. I enjoyed RoL a lot, especially the revolving solo between Howe, Igor and Sherwood. They did something interesting with _that_ Rabin tune. 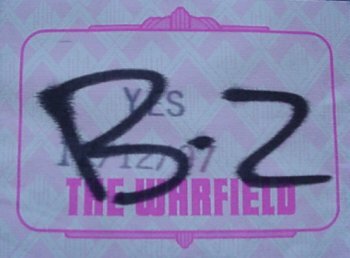 Well, I've just returned from Friday's Warfield show in San Francisco. I'm going to try not to repeat a lot of things from other reviews that--surprise--turned out to be true. Mainly I just want to say that this concert was like seeing old friends again after a long separation and finding everything still right. (My last Yesshow was on the Tormato tour). It's so heartening to see the guys, who are getting a bit older, along with all of us (except for Jon, who seems to have discovered the secret of eternal youth) still putting out their incredible music in public with an undiminished spirit. And in some ways they've never sounded better. Igor _is_ the Man. I expect to hear him all over the next record. His solo even strayed into adventurous territory at one point, besides displaying chops galore. I was hoping that one rotating number in Steve's solo spot would come around to "The Valley of Rocks" for this show, and lo and behold, I got my wish! "Ram" and "Clap" were properly shredded as well. After all the talk about how loud they play, I was pleasantly surprised to find that the volume was not excessive from my seat (which was at the very top of the balcony, granted). The sound balance was excellent, with exceptions noted below, and they only overdrove the hall at a few points. I hope the people around me didn't mind that I provided low harmony backing vocals on the chant of "The Revealing..." It was beyond my control, honestly. I have to find a new dream now that I've heard this song performed live. Right after "Revealing" they played a snippet of something or other that I think Jon was saying was a work in progress. Anybody know what this was? Sounded pretty funky. What is there to say about Chris "Butch" Squire, anyway? He knows he can drive the front row crazy by just _threatening_ to pick a low G on his Rick, so he goes ahead and does it! He did eventually get around to playing quite a lot of notes, and, strangely enough, they were all in exactly the right place. It takes a lot to get me to dance at a concert, but when they swung into "All Good People" from "Your Move", I got happy feet! Maybe the best live rendition of this one I've heard. In the middle acoustic guitar break in "Roundabout", Steve snuck in something that sounded a lot like his opening notes in "Mind Drive". Clever fellow! Doesn't anybody play the Mellotron anymore? They skipped the first verse of "Children of Light". Very disorienting. OK, it's late now. Gotta go. Thanks for listening, it's been a day worth remembering.